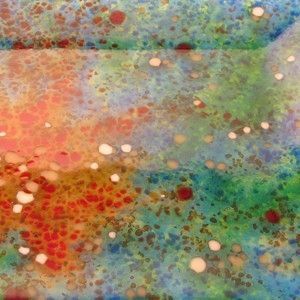 A Spitzer telescope photo of Nebula M17 inspired this dramatic design for a variety of fused glass dishes that Mary Ann has created. No two pieces in the Nebula style are exactly alike but all combine primarily blues, greens, and reds. 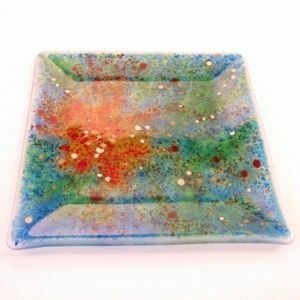 This 10" square plate was created by melting ground glass on to clear glass in a 1500 degree kiln. In the next step the glass was heated to about 1200 degrees, softening it enough to slump into the plate mold. Other shapes I've created in the Nebula style include candle holders, small square and oval dishes, and a 12" x 17" platter. Each finished piece is signed and numbered.